We have had great success with our flower gardens. We were ready for a vegetable garden. Last spring my husband Jon and I planted our first vegetable garden. We researched gardening websites to learn how to go about planting one. We watched YouTube videos. We made a list of the kinds of vegetables to grow. We drew a diagram of vegetables to grow next to each other and apart from each other. We decided on a 4 foot by 12 foot raised bed garden. We then went to Home Depot for supplies. We bought 32 feet of 2″ x 8″ wood boards chicken wire, mesh, and four stakes. We bought bags of organic garden soil to mix with the soil we dug from our backyard. We lined the ground with chicken wire and plastic to prevent ground hogs from tunneling from below to pull out the roots. We purchased small organic potted vegetable plants – 4 each of tomato plants, kale, red lettuce, romaine lettuce, strawberries, squash, eggplant, oregano, cilantro, spearmint, and red, orange, and yellow peppers. To keep deer away, we bordered the four corners of the garden with the scent of perennial lavender plants. Marigolds adorned the garden through out to attract bees, butterflies, and lady bugs. We wrapped mesh around the stakes. We protected the garden with mesh to also keep away birds, groundhogs, squirrels, rabbits, and opossums from devouring the garden. We finished planting our first vegetable garden in April. By May and through out the summer we feasted on kale, red lettuce, strawberries, spearmint, cilantro, and oregano. The tomatoes were slower to grow but we picked them from the vines in July, August, and September. The peppers brightened the garden in August and September. 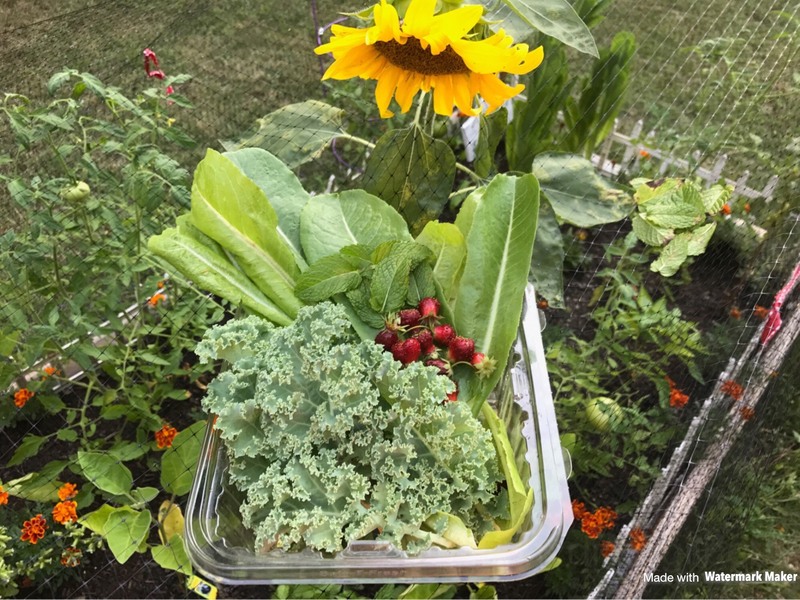 Kale, red lettuce, and romaine lettuce were plentiful all summer, and the strawberries, while small, grew like wild flowers. Our first vegetable garden was a pleasant success. The only vegetables that failed to grow were eggplant and squash. We eat lots of salads in the summer time but last summer we ate our home grown kale, red lettuces, and romaine. My husband and I enjoyed them with dinner and lunch. I especially enjoyed going to the garden before lunch or dinner to cut what ever the garden had to offer on any given day. Either before or after a training run, I’d make a salad with leftover chicken or pork rolled up in romaine leave, or sardines in olive oil and egg on a bed of red lettuce and romaine, or a grilled hamburger sautéed in onions and mushrooms served on a bed of kale and romaine. Last week we planted spinach, cauliflower, and cantaloupe seeds in egg cartons and almond yogurt containers. We will build another raised garden bed for these fruits and vegetables and we will grow the same vegetables we grew last years. Planting a vegetable garden is not overwhelming. But it does require patience, patience, willingness to learn, time, and tender loving care. Click on useful gardening website and YouTube video links below to help you build a raised bed vegetable garden. You can also choose to grow a a container garden, an in-ground garden bed, or a window bed garden. The physical act of gardening and weeding, whether a flower or vegetable garden, is a very fulfilling and meditative experience. To read about the spiritual dimension of gardening, click here and read my article about my flower gardens published in Huffington Post. There is no much more about vegetable gardening that we need to learn and master but the seed is firmly planted. We were pleasantly surprised to see a stunning sunflower sprout, grow, wiggle its way through the mesh, and tower over to make the garden more magnificent all summer and autumn. You never know what you’re going to get when you plant a vegetable garden! Patience and tender loving care produces a colorful bounty.